Sorry about that, a poor pun. 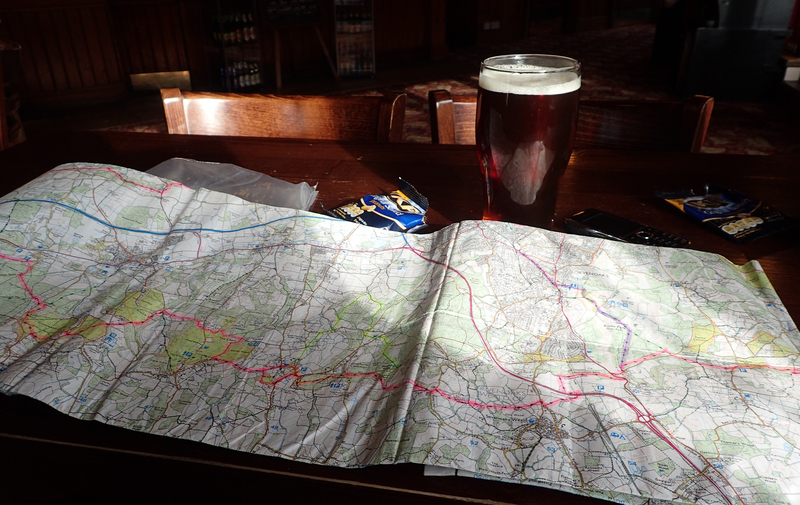 Seeing as I am currently working out my meals and snacks for my forthcoming six day wander along the splendid Ridgeway. I have been looking a little more closely at the relative worth of the various snacks and nibbles that I am taking with me. 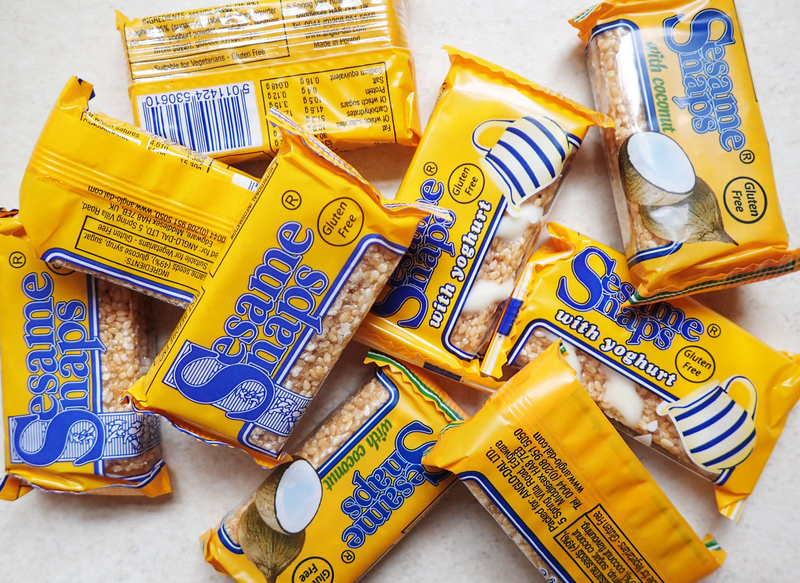 I have been aware of the remarkable weight/calorie ratio of Sesame Snaps for some time so paid a visit to the local supermarket to pick some up. I have no idea how long there have been additional choices but was pleased to find that the range (originally of one) now includes ‘with yoghurt‘ and ‘with coconut‘. A glance at the Polish manufacturers website tells me that there is also a chocolate covered version, but this has proved impossible for me to find. A similar type of confectionery used to be made with honey however this seems to have been excluded from the current recipe that Anglo-Dal work to. Anglo-Dal is a private company established in 1939 who supply a range of food and drink to Middle East and European countries, including the UK. 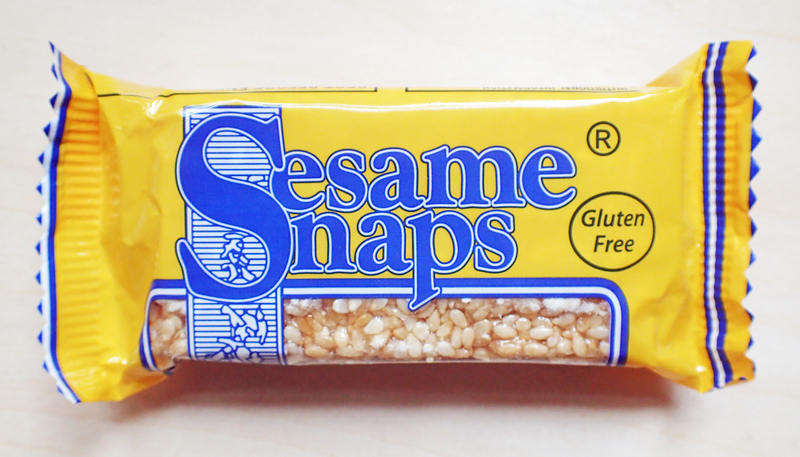 Sesame Snaps have been on UK shelves for as long as I remember and are a handy little product to consider for backpacking. The 30g packs comprise of three thin wafers. Each being made of 49% sesame seed encased in glucose syrup and sugar. I have not had problems of this actually melting but it can become a little sticky in the hand, so best to open with care and eat directly from the cellophane. The little wafers are sweet with a nutty, crunchy texture. It is worth noting that sesame seeds provide around 565 calories per 100g. Half of the pack is sugar, so consumption needs to me moderate. But if a quick energy burst is required, snacking on these whilst on the go is a better option than a handful of gummy bears, jelly babies or most other sugar products. Despite the high sugar content, the original Sugar Snaps are actually a fairly healthy option. 30g contains 157 kcal (the original sesame wafers) of which only 8.67g is fat. 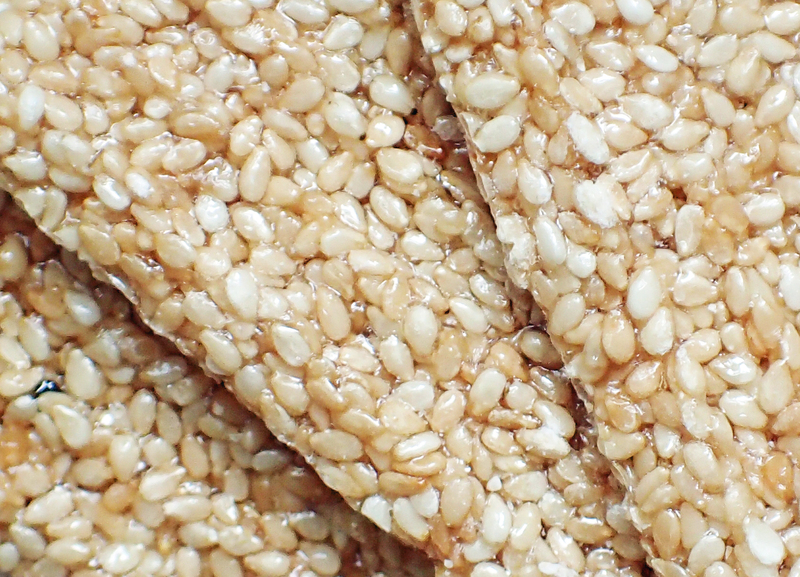 High in nutrients, Sesame Seeds are rich in omega 3 oils. The product is lauded by many vegetarians- it is Dairy, wheat, gluten, soya and sulphite free, not that any of that particularly concerns me. There are slight calorific differences in the varieties, those with coconut provide 160 kcal per 30g pack and those with yoghurt 159 kcal per 30g pack. 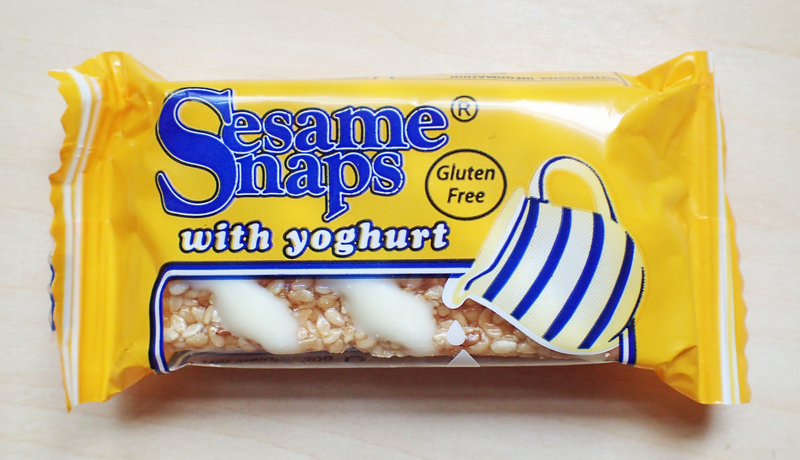 While tasty (I especially like the yoghurt version) the yoghurt snaps do contain less actual sesame seed. Only 37% of sesame seeds are in these, while the yoghurt makes up 26%. 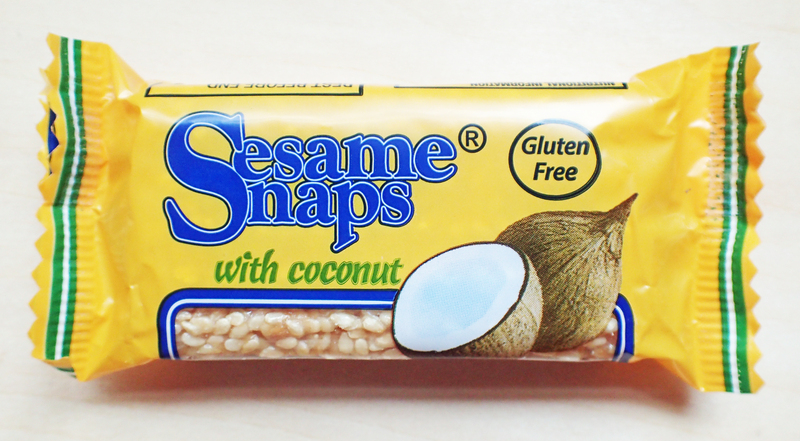 The coconut snaps retain a 49% percentage of sesame seeds. Salt content is pretty low at 0.08g/30g. If you like the idea of these but are scared off by the sugar content, I note that some creative people have successfully produced their own homemade versions that sound interesting. Me though, I can’t be bothered, so will continue to slip a couple of the little yellow packs in to a side pocket of my pack. Shelf life is good and they can handle a bit of a battering on the trail. This entry was posted in Food, Uncategorized and tagged Food, Salt, snacks on April 23, 2016 by Jools. 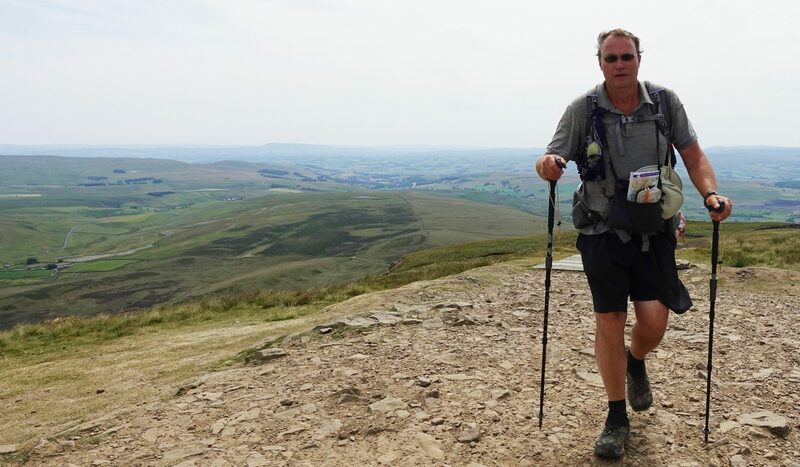 As part of my recovery from Plantar fasciitis I have decided to walk the Ridgeway, west to east, from Wiltshire into Oxfordshire, over one week in May. The trail has been called the oldest road in Britain, or even Europe for that matter, but that is probably pushing it a little. Certainly it is a route travelled by Neolithic and Bronze Age people who in addition to trade, also took their time to build monuments and bury their dead. Ancient ditches, earth embankments, Iron Age forts litter the way across the North Wessex Downs and Chiltern Hills. I am very much looking forward to my week. I have been struggling in my recovery from injury. Plantar fasciitis and associated arthritis having severely reduced my capability over the past fourteen months. I have doubts that I will ever again reach my twenty and twenty five mile days I was knocking out only a couple of years ago. Once I had been properly diagnosed and bespoke orthotics created. I began a series of exercises and stretches, combined with some long term lifestyle changes. I then undertook the (full) 153 mile North Downs Way and 150 mile London LOOP as a series of day walks as part of my recovery, only having some thirty miles of the former still to complete. I have steadily increased my daily distance from six to eight to ten, then twelve miles. More recently there have been a couple of fourteen and sixteen mile days, with not TOO much pain. It is now time to see what I can manage over a week, hence the Ridgeway. The Ridgeway stretches 87 miles (139km) to Ivinghoe Beacon , but for some reason it starts in a car park at Overton Hill, which makes no sense at all. So I will start a little further back, at Avebury, thereby adding another couple of miles to the total. Easily worth it to include and explore the huge stone circle, ditches and embankments that encircle the village. So, planning is under way. There is a degree of information online, including the National Trails website. Though to be honest, I haven’t found much of interest or real help. The handful of publications I purchased, shown above, are more than enough to enable a bit of planning for my six day walk. I will be camping the whole way, other than one night in the YHA Hostel at Streatley. Beyond that, I need to sort out the gear I am taking, meals etc. I will follow this post up with a couple more over the next few weeks as these decisions get firmed up. This entry was posted in Food, Gear, Uncategorized and tagged camping, feet, Food, gear, Map, path, Ridgeway, route on April 18, 2016 by Jools. Is there still a need for paper maps? This entry was posted in Uncategorized and tagged gear, Map, navigation, path, route on April 3, 2016 by Jools. This entry was posted in Uncategorized and tagged route, sign on April 2, 2016 by Jools.